Yesterday was my birthday and my husband was out of town on business. So I got myself 4 handsome, younger men and went out on a date. Just wanted to give my boys a shout out (they love seeing themselves on the blog! ), and thank them for making this mama's day so special. They brought me breakfast in bed and wrote me a poem. What more could a girl ask for? Well, maybe that they hadn't set off the house alarm first thing in the morning, so that I woke with a jolt to the sound of wailing sirens. But, I soon realized they accidentally triggered the alarm because they were getting me coffee from our neighbor. God love them! Happy Birthday!! I think that was the sweetest thing for your sons to do for you. I always treasure heartfelt things that my kids do for me. They sure are a handsome bunch! It sounds like they treated you like a queen as well they should. Seriously... this is precious!!! 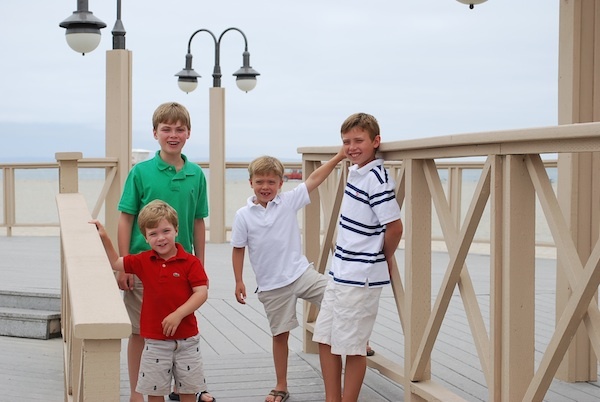 You have 4 really adorable boys and I think it is awesome how caring they are for their mom. Happy Belated Birthday!!! So sweet! Happy Birthday. Sounds like a superb day! What a handsome brood... obviously good genes all around! Happy Birthday! Your kids are so cute. Its just going to a movie that freaks me out right now. Oh your boys are so handsome. Treasure every minute! i have 3 boys and the oldest turns 21 while in Afghanistan next week!! All That Glitters is Champagne Bronze?